With LIFEPAC 2nd Grade Language Arts, student's will learn sounds, letters, words, and sentence structure building a solid foundation to their grammar. Topics cover: From Sounds to Words, Words to Sentences, How the Sentence Begins, Sentence: Start to Finish, and Words: How to Use Them. Worktexts, filled with vibrant illustrations, entertain as they explain word structure, vocabulary, and spelling. Students will also learn cursive writing, consonants, vowels, root words, prefixes and suffixes, singular and plural verbs, and sentences and phrases. Word activities are added to solidify comprehension. 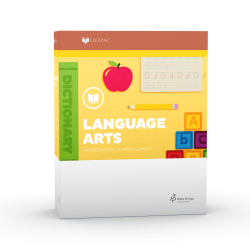 The LIFEPAC 2nd Grade Language Arts Set contains ten worktexts and a teacher's guide.